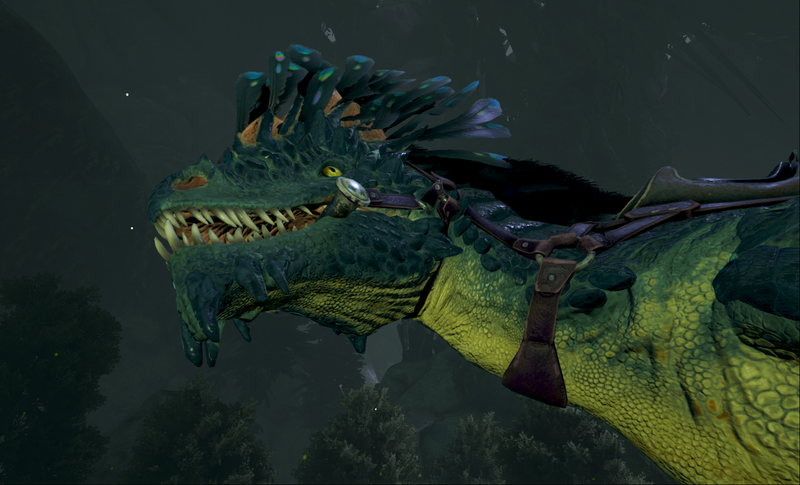 One of the new Aberration specific dino is the Rock Drake, a feathery gliding beauty and all three of us have been working towards getting some to join our dino family and as an awesome New Years present we managed to get a couple to start off with. 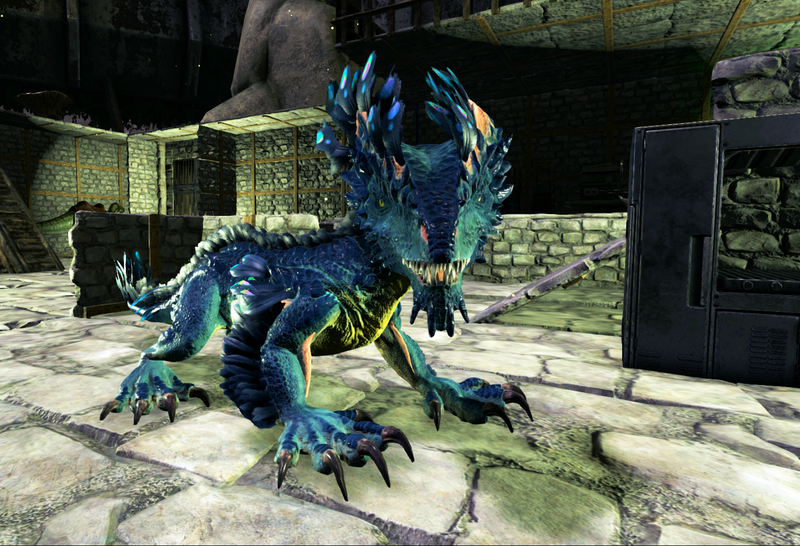 The only way to get a Rock Drake is to make your way down to the deepest, mostly radioactive, biome and steal eggs to hatch your own. The way down is pretty scary; the environment is radioactive, so you need to wear hazard suits, which slowly degrade while exposed to radiation. I was so worried my suit would break I ended up making quite a few to take. 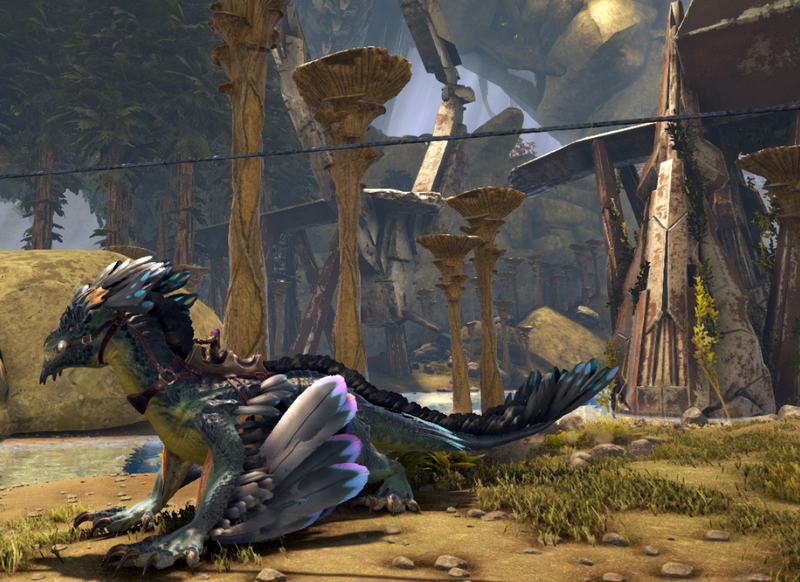 It’s also a juggling act between avoiding Seekers (they look like hairless bats) who are attracted to the light that your shoulder dinos put out and stronger in it and Nameless who swarm all over you when the light is turned out. Dec found a guide that showed a quick way to jump Spinos down a big cliff, avoiding part of the walk, so you can skip meeting a lot of the dinos you’d normally find on the way down but the jump required you free fall a long way, aiming to land on a tiny bit of land next to an insta-death radioactive lake. 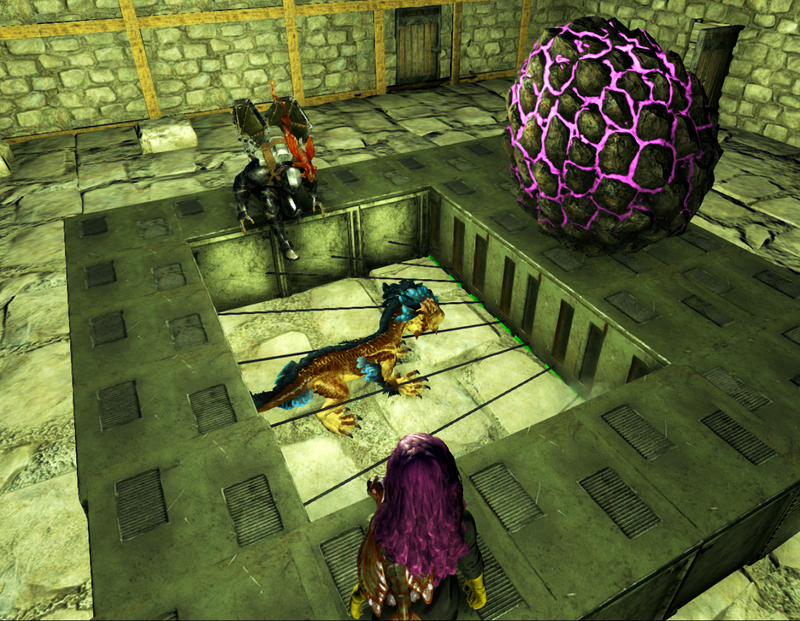 I initially balked at the idea and ended up going into a single player map and practiced multiple times at jumping off with spawned in dinos to try to avoid losing the real ones. Outside of occasional roll backs when things go really wrong, Dec hates the idea of using admin commands or cheats on our servers, trying to keep it as close to official servers as possible, so I tend to use the single player version as a testing ground as I can spawn in items/dinos rather than lose the real ones that take a while to find and tame. We decided to give it a go over the weekend and made it down relatively safely. Despite all my practice, I hit a cliff edge on the first try and bounced away from the land straight into the death lake..Dec had agreed to make a server back up just in case, so we had another go and I landed perfectly. From there it was still quite a walk down however working our way down to the deepest level was a lot easier than I was expecting. I forgot to take any photos because I was constantly rushing in case my hazmat suit broke and I died to the radiation. I actually ended up only needing the one suit, so next time I’ll take my time and screenshot away. The deepest level is all pink and purple and gorgeous. 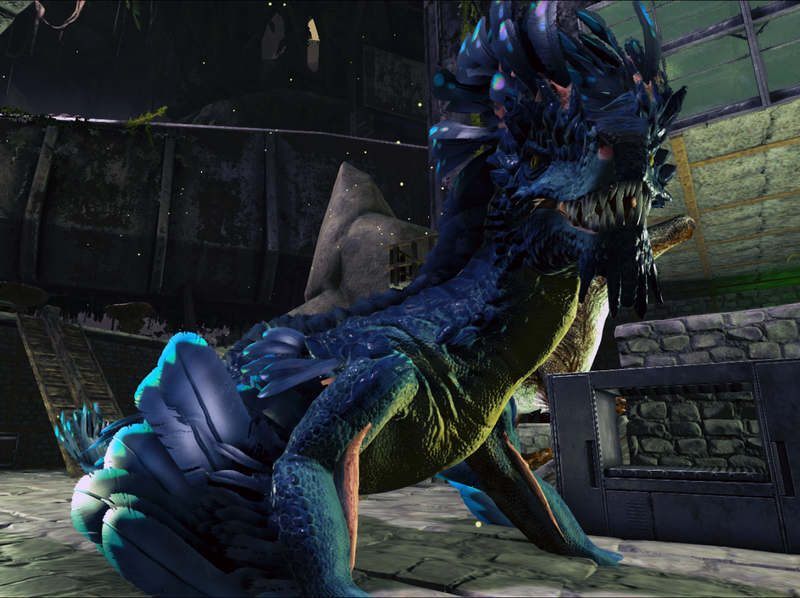 Our plan was to just grab the first easy to reach eggs we could find, regardless of level, as adult Rock Drakes can glide, climb walls and turn invisible which will make getting subsequent eggs way easier. I was really hoping we’d find 3 eggs on the first go, so we’d all have one straight away but we ended up only finding 2 eggs close to each other in easy to grab range. 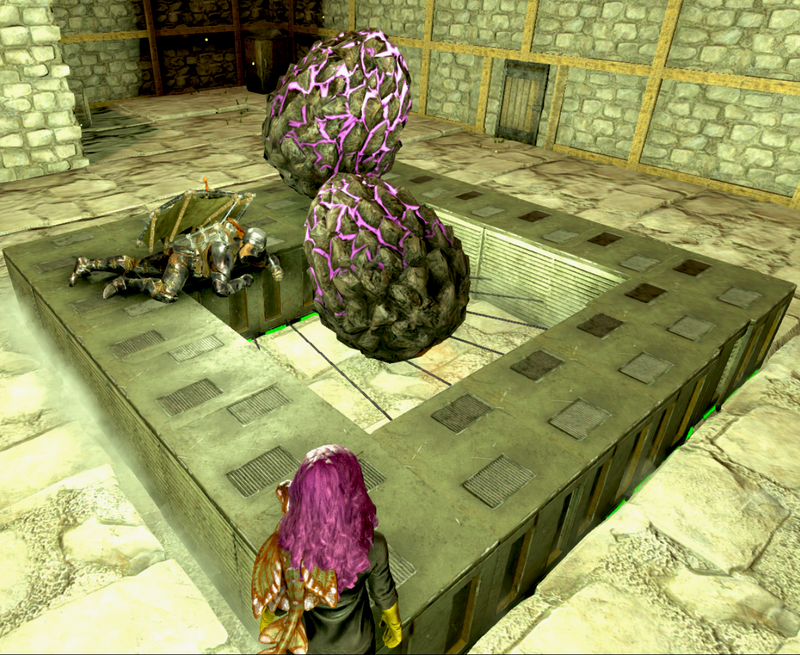 We needed a ton of airconditioners to hatch the eggs, which look rather like purple pinecones more than eggs. 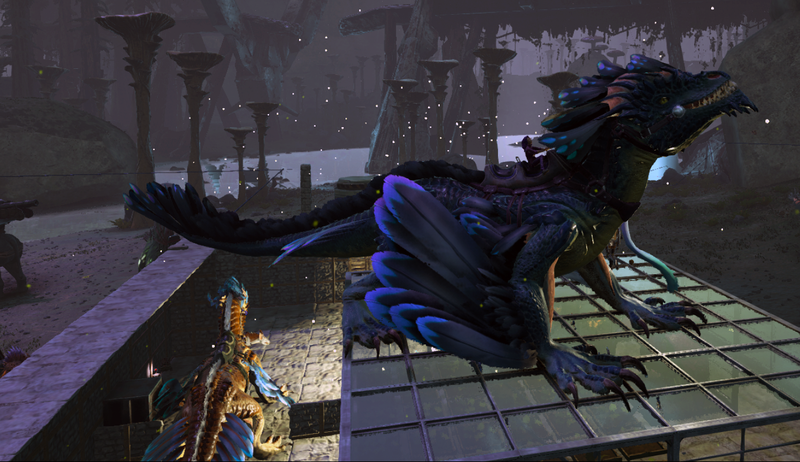 Rock Drakes are just so gorgeous (warning: screenshot spam ahead). They come in a ton of different colour ways, so no surprises I want to go collect enough eggs to have them all. First baby boy came out in gold and blue colours. The second baby was a girl and is a greeny/blue colour. 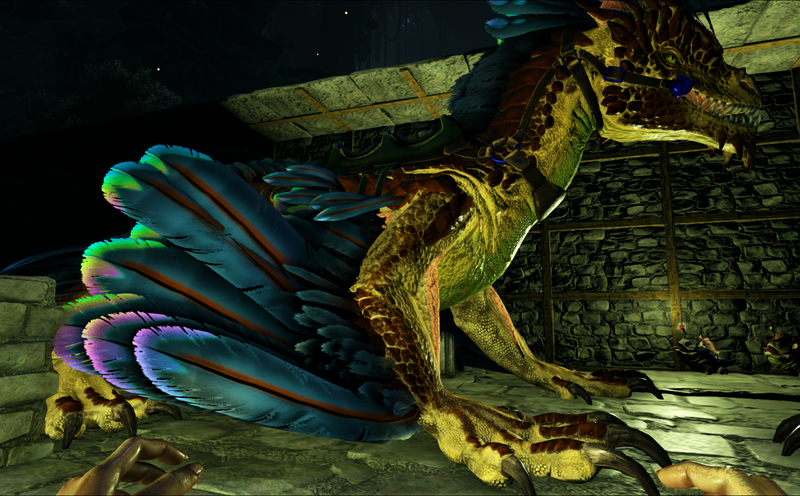 It’s actually hard taking accurate colour screenshots in Aberration. 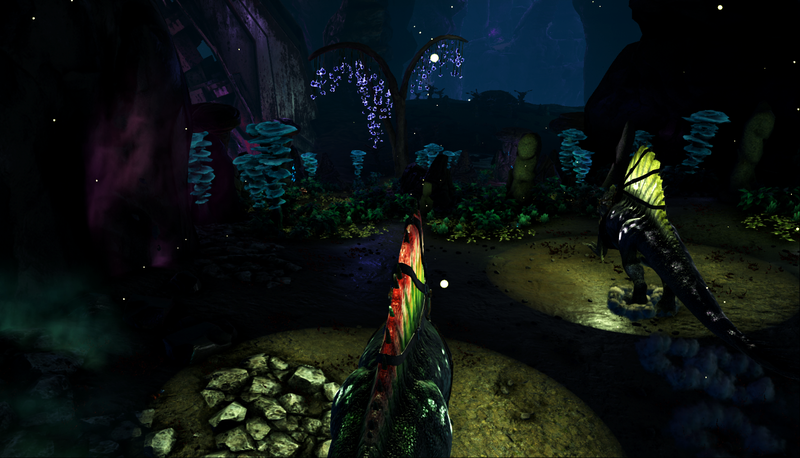 Most of the time the map is semi-night, so I have a dino on my shoulder throwing out light, or I bump the gamma up in game to make it lighter – both of which make taking screenshots tricky. On official severs they’d take about 3 (real) days to grow, but with our boosted rates, it only took about 9 hours from baby to adult. It still felt like ages though, I was so impatient to see them grown up. Look at how gorgeous (and huge) their arm feathers are! By the way, how gorgeous is the hazard suit. I’ve taken to wearing it pretty much constantly just because I love how it looks, especially when dyed in my favourite colours. Luckily it doesn’t degrade if you’re not in radiation or the hallucinogenic mushroom patches because it takes a ton of resources to repair. Gliding is pretty awesome after being grounded for so long. 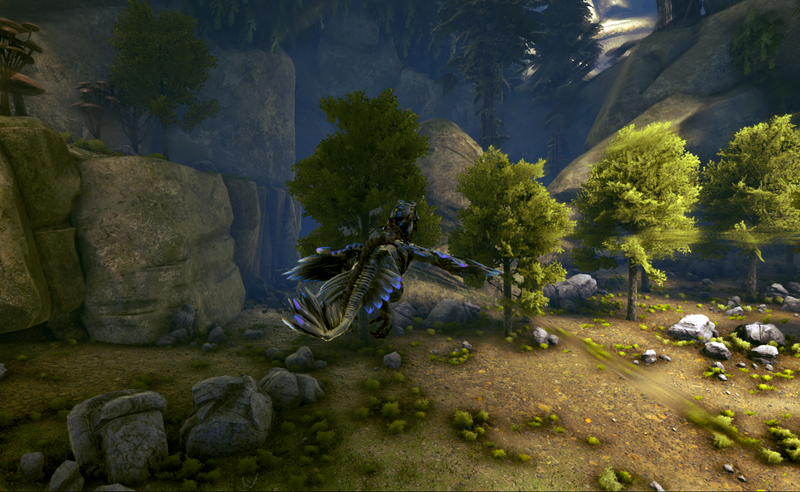 They move super fast too; being able to glide around the map should make it a bit faster to get around. We’re going to need to add a few extensions to the base to include larger platforms to store them all on. 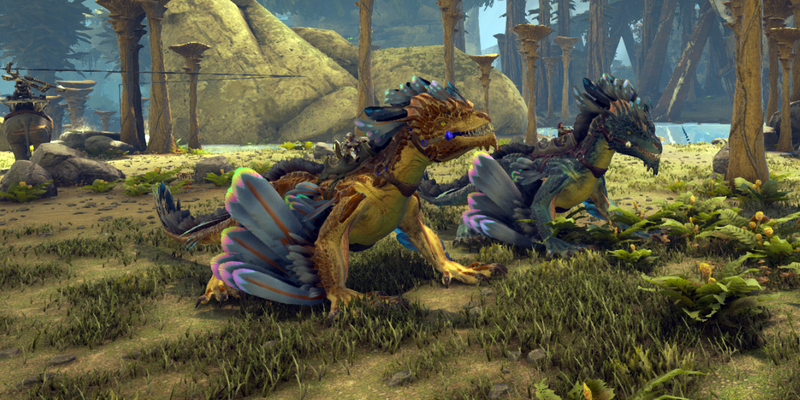 I’m utterly in love with these drakes so much. I can’t wait to go back down and get more. Luckily the saddle seats 2 people, so at least the three of us can go together at the same time. 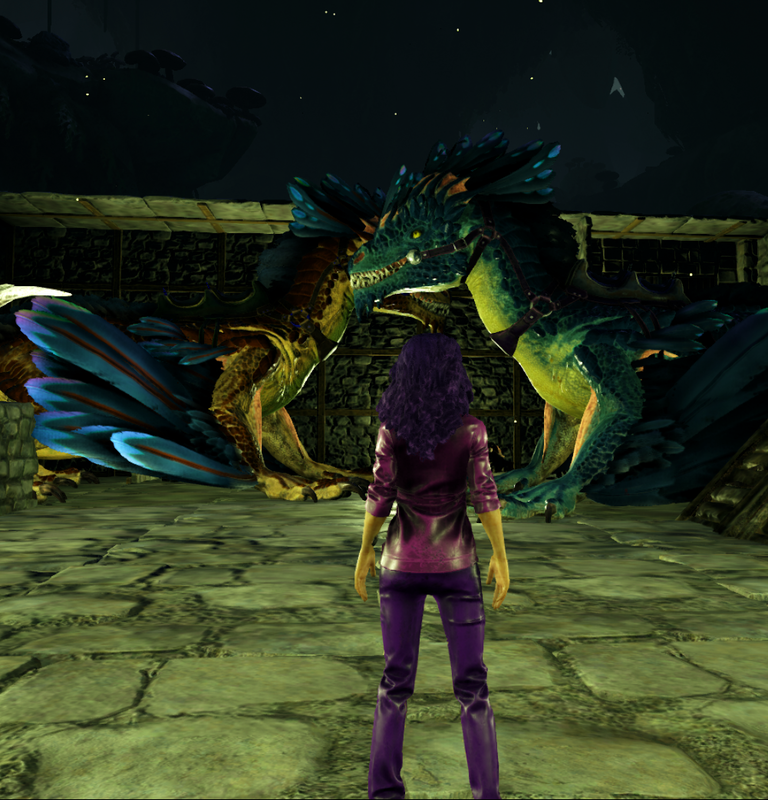 This entry was posted in Ark and tagged collect all the colours, Rock Drakes, soooo pretty by Zeirah. Bookmark the permalink.